That may sound far, but it is 10 times closer than any previous mission, other than probes doomed to destruction sent into the atmosphere. The perils give pause to scientists and engineers working on the $1.1 billion mission, but officials said they did everything possible to equip Juno for the dangers of Jupiter and were cautiously optimistic the probe would complete a one-shot orbit insertion maneuver unscathed. “Juno is going to go into the scariest part of the scariest place that we know about,” said Heidi Becker, a physicist at NASA’s Jet Propulsion Laboratory in Pasadena, California. 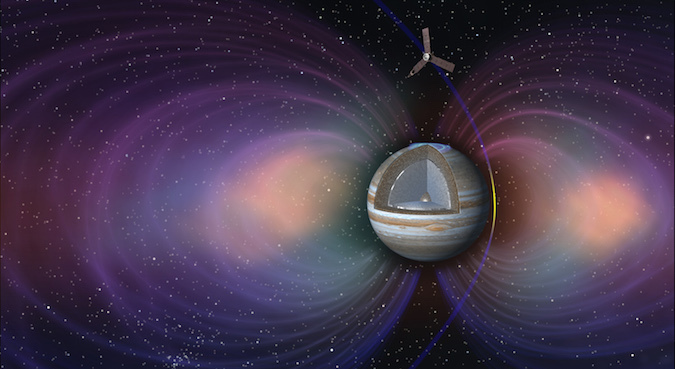 Radiation belts surround Jupiter’s equator, where the planet’s strong magnetic field traps high-energy particles and accelerate them to nearly light-speed, posing a hazard to Juno unparalleled to any environment ever directly explored by a human-built spacecraft. “Jupiter’s magnetic field has accelerated them to the point where they will go right through a spacecraft and strip the atoms apart inside your electronics and fry your brain if you don’t do anything about it, so we did a lot about it,” Becker said. The most critical electronic components aboard Juno are housed inside a vault with walls of pure titanium a third of an inch (1 centimeter) thick. Engineers expect the protective box, which measures about the size of an SUV’s trunk, will block most of the dangerous particles from penetrating into Juno’s sensitive computers and triggering a reset, or worse. 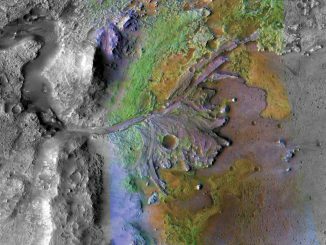 “It’s where we protect our valuables,” said Rick Nybakken, Juno’s project manager at JPL. Jupiter’s magnetosphere, a bubble around the planet under the influence of its magnetic field, extends out 10 times farther than the magnetosphere around Earth. Juno crossed the magnetosphere’s bow shock, a boundary between interplanetary space where the solar wind is dominant and Jupiter’s magnetic field, about 10 days ago as it zoomed toward its rendezvous with the planet. If Jupiter’s magnetosphere was visible in the night sky from Earth, it would appear as big as the moon, scientists said. Juno’s three huge rectangular solar panels, arranged in a triangle configuration like an airplane’s propeller, stretch 30 feet (9 meters) long and contain 18,698 solar cells to generate electricity. At Jupiter’s distance a half-billion miles from the sun, where the cells receive about 4 percent of the solar energy as they did at Earth, the wings produce a mere 500 watts, equivalent to around five household light bulbs. The solar panels are also sensitive to radiation, so engineers added extra-thick cover glass to the each cell. Juno already set the record for the farthest solar-powered spacecraft from the sun. The trajectory Juno will follow Monday is clear of the worst of Jupiter’s radiation, but the craft will still be exposed to doses many times worse than the radiation belts around Earth. 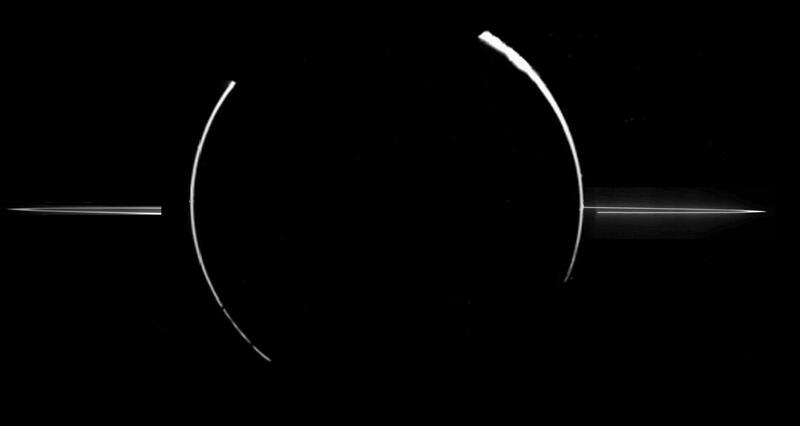 Juno is targeting a section of space near Jupiter that may harbor scattered particles of ice and dust from the gas giant’s narrow ring system, according to Scott Bolton, the mission’s principal investigator from the Southwest Research Institute in San Antonio. Discovered in 1979 by NASA’s Voyager 1 flyby probe, the rings of Jupiter contain flakes of ice and dust — tiny frozen moonlets — deposited around the planet by meteoroid impacts on Jupiter’s larger moons. This image of Jupiter’s rings came from NASA’s Galileo mission, which became the first spacecraft to orbit the planet. 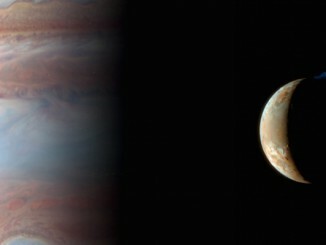 Galileo explored Jupiter and its moons from 1995 through 2003. Credit: NASA, JPL, Galileo Project, (NOAO), J. Burns (Cornell) et al. Juno’s Leros 1b main engine is supposed to ignite for 35 minutes Monday to put the spacecraft into an elliptical 53.5-day orbit around Jupiter. Engineers said the engine must fire for at least 20 minutes to achieve any safe orbit, or Juno will cruise past Jupiter and the mission will be lost. Ground controllers sent commands for Juno to open an engine cover June 20 in advance of Monday’s firing, and the celestial mechanics of the burn require the engine nozzle to point ahead of the spacecraft directly into any potential incoming debris at a speed of 130,000 mph (209,000 kilometers per hour), relative to Jupiter. “The nozzle is open and vulnerable,” Bolton said. “We’re flying through faster than any object has ever gone with the nozzle facing forward. If any dust is in our way and hits that nozzle, it will knock a hole right through the coating that protects the nozzle and allows the engine to burn uninterrupted. So that’s one of the big gambles. A microscopic dust grain as small as 10 microns — about the size of a water droplet in a cloud — could cause damage at Juno’s velocity, Bolton said. Juno will face Jupiter’s hazards for the first time at the riskiest part of its five-year journey since its launch in August 2011. The craft’s main engine must fire at the right time, and in the correct direction, for Juno to swing into orbit. Ground controllers expect to receive confirmation from Juno’s radio beacon that the burn is underway at 11:18:25 p.m. EDT (0318:25 GMT). Tones transmitted by Juno’s low-power antenna will tell engineers about the status of the 35-minute engine firing. The signals come in at slightly different frequencies, giving officials information about the progress of the insertion maneuvers based on the pitch of the tone. Juno’s primary rocket thruster, made in Britain by Moog-ISP, has fired up two times since its launch, successfully adjusting the probe’s course on the trip to Jupiter. 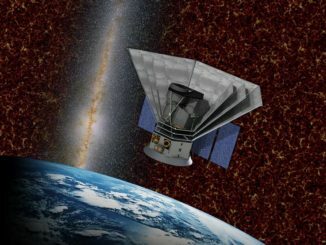 But Monday’s event will occur under new conditions, at higher speeds and with radiation and a potentially disorienting magnetic field nipping at the spacecraft. “When we receive the last tone that tells us the burn is successful, that will be music to my ears,” Nybakken said. “We need to get into orbit tonight, and I’m very confident that we will,” Nybakken said. Juno will repeat Monday’s close brush by Jupiter 36 more times before its mission is complete Feb. 20, 2018, when the craft will head toward a crushing dive into the atmosphere. Jim Green, a space physicist based at NASA Headquarters in Washington, has been at the helm of the agency’s planetary science division since 2006. NASA’s Curiosity rover landed on Mars, the Messenger mission became the first probe to orbit Mercury, and the New Horizons spacecraft explored Pluto during Green’s tenure, and he’s also on the edge of his seat.